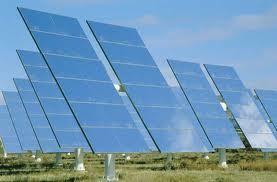 RCR utilizes solar modules, also called photovoltaic (PV) modules, to convert sunlight directly into electricity. These modules utilize semiconductor materials (e.g. silicon) similar to those used in computer chips. When sunlight is absorbed by these materials it is the solar energy that knocks electrons loose from their atoms, allowing the electrons to flow through the material to produce electricity. This process of converting light (photons) to electricity (voltage) is called the photovoltaic (PV) effect. 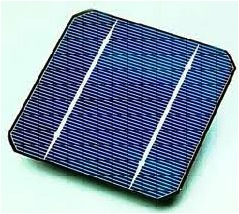 Amorphous silicon thin film PV modules are built by depositing a thin layer (less than one 10,000th of a cm) of silicon on top of a substrate, like glass. Such thin layer of deposited silicon films do not have any crystalline structure (pattern) and hence are called amorphous silicon films. Appropriate p-i-n junctions are made within this thin film by controlling the type and amount of doping (boron or phosphorus). Metal interconnects are used to bring the generated electric current out of the modules. Another sheet of glass encapsulates this thin film structure using an adhesive material. This glass-glass module is much like what is used in making windshields in the auto glass industry. 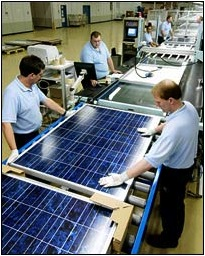 Typical module efficiencies are in the 6-8% range. By depositing an additional micro-crystalline layer on top of the amorphous layer, a larger portion of sunlight is absorbed, leading to higher solar module efficiencies (8 -10%). Thin film PV modules are the fastest growing segment of the PV market due to rapid technological and manufacturing innovations. RCR has chosen amorphous silicon technology as its platform because it has the greatest potential for cost reduction and large-scale manufacturing. Renewable energy such as wind, wave power and solar collection are the principal resources in the toolbox and are now accepted as a principal contributor to the energy sector and is experiencing a 25% annual growth rate in market supply and penetration. Issues of zoning, suitability of location and NIMBY issues beset a number of viable renewable energy solutions with expensive and lengthy zoning applications, public consultations, appeals and perceived or real environmental impact and many do not proceed beyond the drawing board. Solar Power, of all available energy sources (renewable or otherwise) is the one that best correlates with the demand for water because solar intensity is the biggest single impact and main cause of water scarcity. Solar Power as a resource-potential dwarfs the global energy demand by several hundred times and its environmental impact is generally seen to be acceptable since it uses concrete, steel and glass – all materials in plentiful supply – in the construction of CSP collectors. Over time CSP is expected to become the cheapest source of energy and is deliverable for continuous operation of seawater desalination. 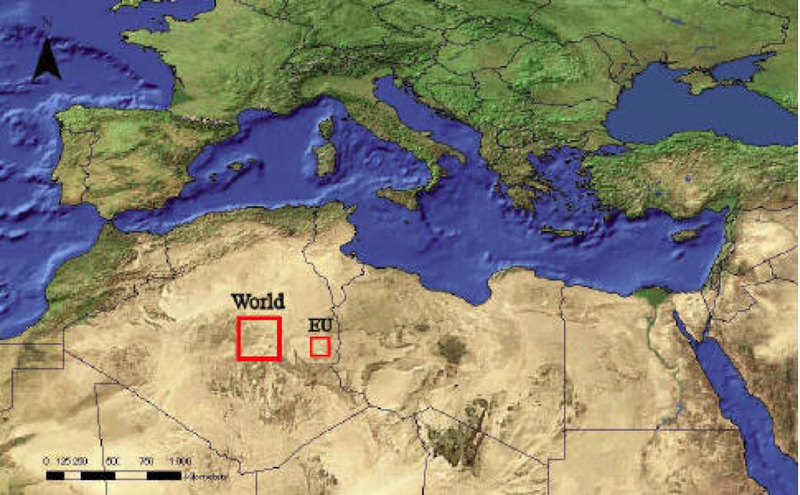 The larger red square on the left shows an area of 254 km × 254 km of hot desert that, if covered with concentrating solar power plants, would provide electricity equivalent to the current annual electricity consumption of the whole world. The smaller square (110 km × 110 km) shows a corresponding area for the European Union (when it included 25 countries). Every year, each square kilometer of hot desert receives solar energy equivalent to 1.5 million barrels of oil. Multiplying by the area of deserts worldwide, this is several hundred times the entire current energy consumption of the world. The cost of collecting solar thermal energy equivalent to half a barrel of oil (Oil currently $100 a barrel) is about US$50 right now (already much less than the current world price of oil) and it is likely to come down to around US$20 in future. Quote: “… analysts evaluated the solar resource in the Southwest [of the US] and … found that CSP could provide nearly 7,000 GW of capacity, or about seven times the current total US electric capacity.” (Tackling Climate Change in the US, American Solar Energy Society, January 2007, page 17). Solar technologies using concentrating systems for electrical production require sufficient beam normal radiation, which is the beam radiation, which comes from the sun and passes through the planet’s atmosphere without deviation and refraction. 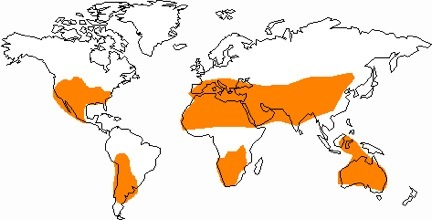 Consequently appropriate site locations are normally situated in arid to semi-arid regions.